"Der Fuerher’s Face" wasn’t the cleverest satirical song, but it was one of the more financially successful. And it is funny, in a silly way. Premiering on the radio in the summer of 1942, it became the first hit for Spike Jones and His City Slickers, allowing the zany tunesters to quit their day jobs as serious studio musicians and go on to become one of the biggest musical novelty acts of all time. The song was conceived in the fertile mind of Walt Disney. While his studio was working on a Donald Duck cartoon making fun of the Nazis, Disney approached songwriter Oliver Wallace to come up with a song fast. “Suppose the Germans are singing it,” Wallace recalled Disney saying. “To them, it’s serious. To us, it’s funny.” Wallace came up with lyrics that featured the recurring line “Ven der Fuehrer says, ‘Vee ist der master race,’ / Vee Heil! Heil! Right in der Fuehrer’s face!” It’s sung with a playfully exaggerated German accent, and every “Heil!” is punctuated by a raspberry (the famed Bronx cheer). Even the dullest listener must have noticed the allusion to breaking wind at Adolf Hitler. “Der Fuehrer’s Face” introduces and ends the cartoon, which begins with Donald asleep in his bed when he’s rousted to attention by a German marching band passing in the street. He goes outside and follows the musicians to a Nazi munitions factory, where he works on an assembly line, taking harsh orders until he suffers a nervous breakdown. In the end, Donald wakes up to realize it was all just a nightmare and he’s still at home in the land of the free. 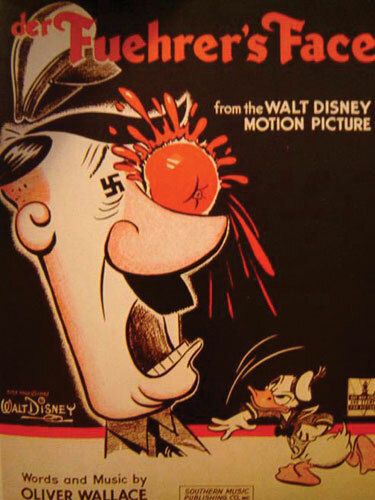 The cartoon won Donald his only Oscar, but then disappeared for decades, seemingly hidden in the cellar by Disney due to its overtly propagandist nature and the potentially touchy fact that Donald plays a Nazi (albeit an unwitting one in a nightmare). The short finally reappeared in 2004 on DVD as part of the limited edition collection Walt Disney Treasures.